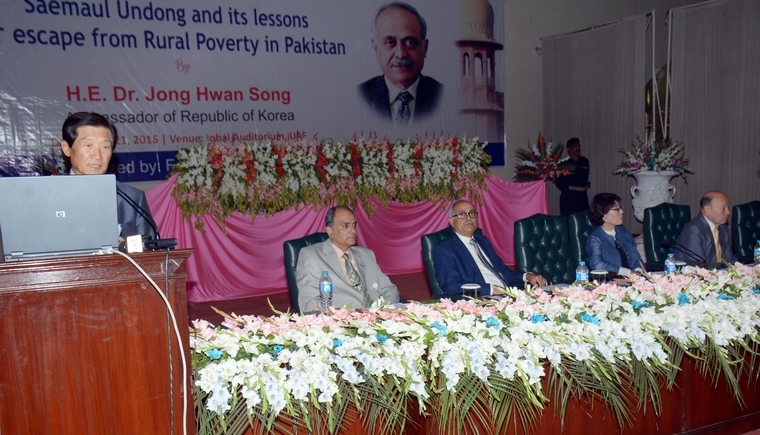 Outgoing Korean Ambassador to Pakistan Dr Song Jong-hwan on Thursday announced establishment of Pak-Korea Hi-tech Agricultural Innovation Centre/ Technological Park worth 29.11 million dollar at the University of Agriculture Faisalabad. It will help replicate Korean rural and agricultural development model and to move the country towards the development and prosperity. 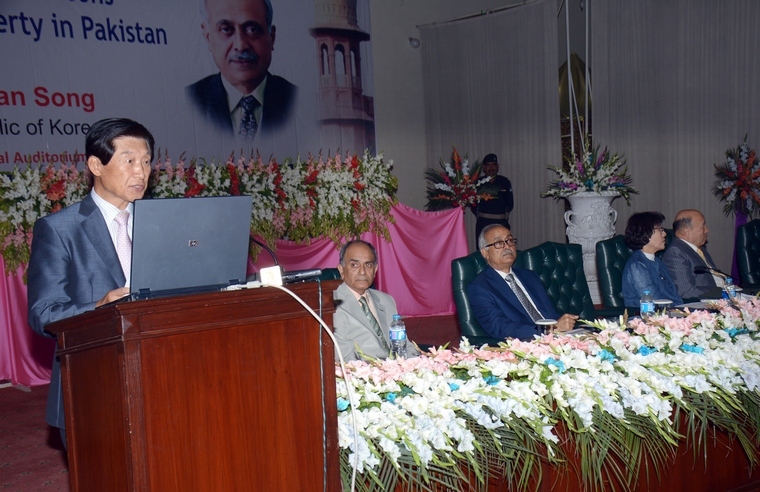 He was delivering a special lecture on Saemaul Undong, the rural development model, at the University of Agriculture Faisalabad. 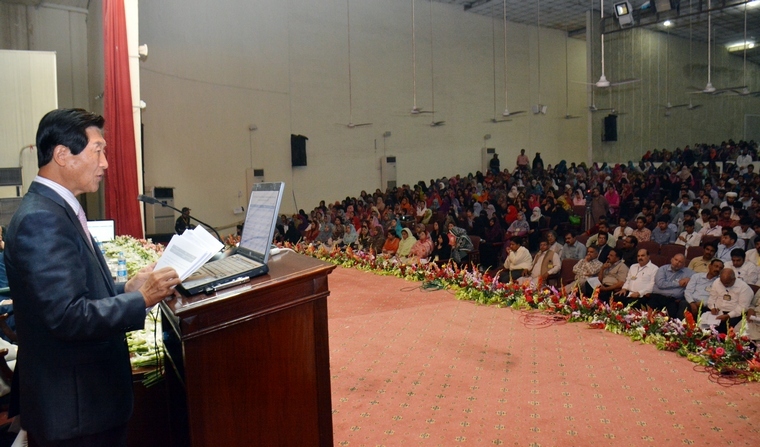 The session was chaired by UAF Vice Chancellor Prof Dr Iqrar Ahmad Khan. The Ambassador said the Centre will also focus on hybrid seeds, GMO, Biofertilizer, animal vaccine R&D and commercial production, drug development, Value Addition/Product Development and Bioenergy. He said that after starting the project of establishment of centre at the University, they would request Pakistan to designate Special Economic Zone for greater investments by Korean companies. He said that 2009 to 2015: Korea has worked hard to share this model with 20 developing countries. He said that in 1961, Korea’s per capita income was just $85, which was less than the average per capita income of the least developed countries. And now the income is standing at around $ 2800 per capita. He said that Pakistan’s agricultural economy is like Korea in its 1960’s &70’s : farmers composed 60% of the population of Korea at that time, much like Pakistan today. He said that Pakistan can emerge as Asian tiger due to its potential including fertile land with largest Irrigation system, big population - almost 200 million. Talking about the education, he said that education is the key for the uplift in which special focus was given in Korean. He said that even they had spent 20 percent of Gross Domestic Product on education in the past years. Talking about Saemaul model, then President Park Chung-hee launched the Saemaul Undong or the New Village Movement on April 22, 1970. The Saemaul Undong is a village-based rural development program to escape from poverty. The Saemaul Undong spirit is based on diligence, self-help and cooperation amongst farmers who composed 60% of the population of Korea at that time, much like Pakistan today. From 1970 to 1979 Korea had a six-fold income increase for rural households. Villagers supplied the labor and also contributed their own finances voluntarily towards making their village better. Saemaul Undong created 5 paradigm changes for the farmers. First, the focus of Korean farmers shifted from quantity to quality. Secondly, instead of focusing on size of farms, farmers started considering environmentally safe agriculture. Third, Korean farming shifted from high input production to low input, sustainable production by reducing labor intensive practices and increasing mechanisation. Fourth, instead of producing what the farmers wanted, famers started to produce what the consumers wanted. Lastly, Korean farmers evolved business practices which allowed them to get an income from byproducts like tourism, camping and training rather than only agricultural products.